Eventually, we will see a nicer day break out across the region as the shield of rain pushes east over the next few hours. We'll detail things in a bit more clarity around timing and detail in a bit but as of now the thinking is that showers will push eastwards. It may take until the afternoon for all of the region to get out of the showery regime, with south and east the last to see showers end. If you're north and west, we should see things dry out by as early as midday. A line of heavy rain and wind is across Central PA and is marching east this morning, with a severe storm watch out across the "T" out to our west until 10 AM. Thunder is limited with this line but the threat for gusty winds is not. Some sunshine will break out to the west and northwest in the midday and afternoon hours, perhaps reaching Philly before dinner. Sunshine may not break through the cloud deck at the Shore until this evening. Southerly and southwesterly breezes at 15 to 25 miles per hour will gust higher this morning, especially until the band of showers pushes through, and then in areas where the sun breaks out. We should see winds wind down towards dinner and into the evening hour. Wind advisories are out for everyone except Sussex County, Delaware until 2 PM. 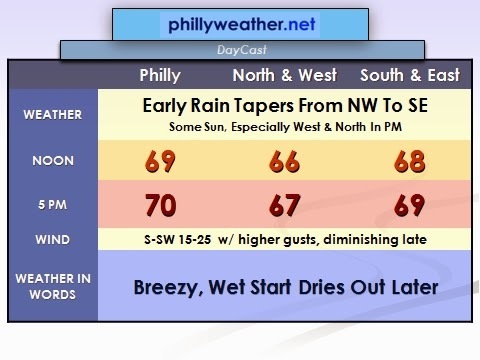 Temperatures will bounce around a bit today -- Philly is 72 at 5 AM and will probably see its highs for the day occur before the front crosses the region. Temperatures won't drop dramatically behind the front, probably holding steady for the balance of the day. Expect a general "near 70" this morning trending to the upper 60's to near 70 this afternoon, although temperatures may vary a bit within that framework later this morning with the front.